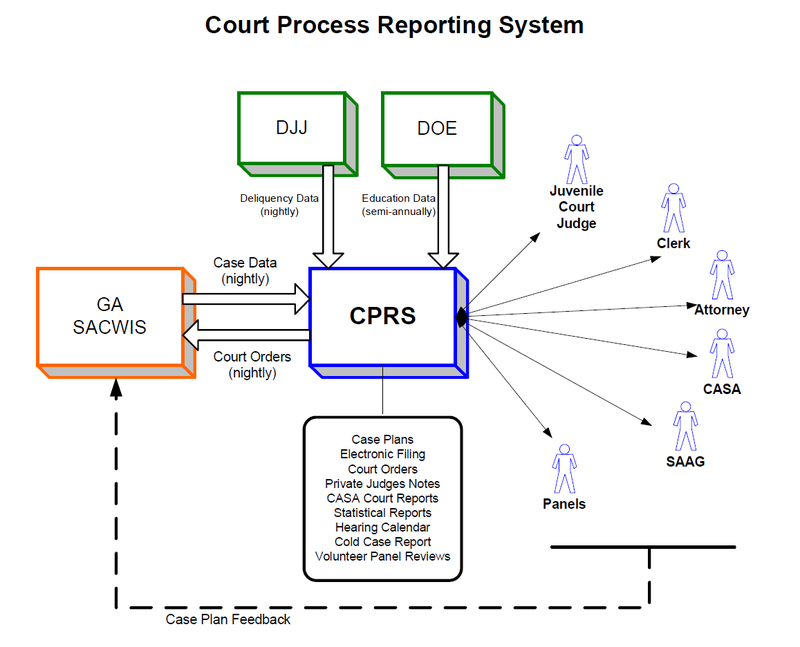 The Court Process Reporting System (CPRS) is joint program between the Supreme Court of Georgia Committee on Justice for Children (Georgia’s Court Improvement Program) and the Georgia Division of Family and Children Services. The Supreme Court of Georgia Committee on Justice for Children has contracted with Object Resource Group to develop and maintain CPRS in full partnership with the Georgia Division of Family and Children Services. The purpose of the joint-project is to use technology to improve access to information otherwise available only in paper form to professionals and volunteers participating in civil child abuse and neglect proceedings. In addition, CPRS provides a number of administrative tools to help users manage information and monitor their cases. These features can be used anywhere the user has an internet connection and work in most available web browsers. Access to CPRS is pre-approved by DFCS as well as the local juvenile court judge. DFCS will grant access to general categories of users (e.g., Judges, CASA Volunteers, Attorneys, etc.) and the local juvenile court judge will grant access to specific users within those classes. Different classes of users have different levels of access to ensure the confidentiality of the children and families we serve is protected.